Immunet uses cloud computing to provide one of the best free antivirus programs available, using their entire online community to build their defense. It stays connected to a network totaling well over two million Immunet users. Whenever a member in the community is attacked, Immunet stores the data and uses it to build more robust antivirus protection. Provides intelligent scans to detect viruses, spyware, bots, worms, etc. Never needs to update because it’s always connected to the internet. Has corporate solutions via AMP for Endpoints (a partnership with Cisco). Real-time detection of viruses, worms, bots, spyware, keyloggers, and Trojans without ever downloading an update. Installs on 32-bit and 64-bit versions of Windows. The ability to quarantine infected files. This can be useful when you want to save something important and only remove the virus, which an IT professional can assist with. On most modern Windows systems, it only requires 1 GB of random access memory (RAM) or less. Regularly updated support forum written in language that is easy to understand. Immunet makes money through its corporate clients and upgraded private users. The free version is robust, but you need to consider some of its drawbacks if you plan on using Immunet as your sole antivirus program. No automatic detection of viruses on USB drives. Doesn’t support scheduled or offline scanning. If you are looking to connect, their online presence feels disingenuous and scammy, and for an antivirus program, they should have a larger and more helpful social media presence. Does not always function correctly offline, and latent virus programs could be triggered when you disconnect from the internet. When the program is running heavily it can be a real drag on processing speed, slowing down other demanding programs like those used for games or design. The program works across a large range of Windows versions, from Windows 10 all the back to Windows XP. It can be used in conjunction with other antivirus programs, which initially seems like a plus, but notifications can seem annoying and never-ending if the programs contradict each other, which can be the case depending on your computers antivirus settings. The interface is not the most attractive, but since the program performs admirably, it should not be much of a consideration, although Immunet desperately needs a visual update. A major plus about Immunet is that it’s always connected to the internet — when you are — and so can always update its defense definitions with information every other Immunet user gathers. This is Immunet's largest selling point and, frankly, about the only thing that sets it apart from other antivirus programs. Immunet, however, can completely replace antivirus software from companies like McAfee and Norton that charge for their software and for yearly access to important, often crucial updates. 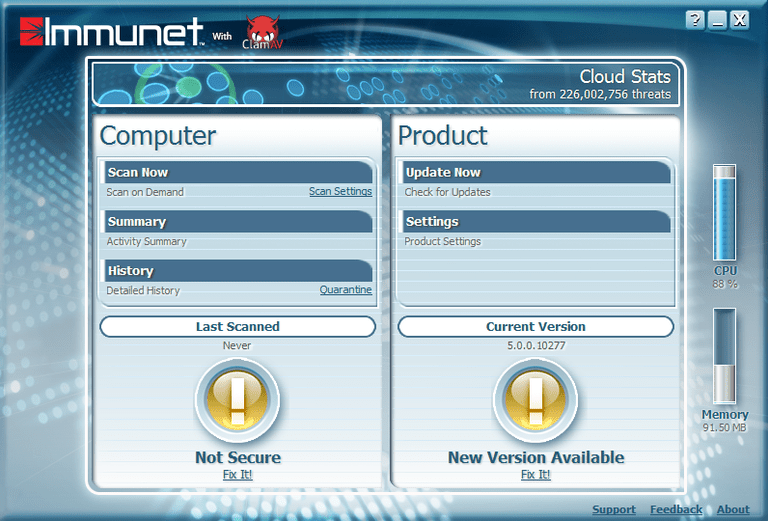 This constant updating, plus the cloud-based defense web, make immunet one of, if not the, most attractive free antivirus programs available. Is UnThreat Antivirus Worth the Download?